arbuclo - Your pebble bread looks great. Last week I made the danish braid and used some cherry pie filling and the almond spread from the Twice Baked Brioche. Yum. No pictures - it was devoured in minutes. This was very easy to do. Next time I think I will do Strawberry puree and a cream cheese filling. Newbie baker question. I am baking my first thing from the book, the potato loaves. The recipe specifies using a linen towel for the rise. Why linen? Can I use some other towel fabric? Cotton? good question. I don't use linen. I always use cotton. Just make sure it's very floury when you put the potato loaves on so they don't stick. When you've done them I love to hear your thoughts on the shaping of the loaves. This is one of my fave recipes in the book! This weekend I did the Danish Braid w/ pureed strawberries and cream cheese and raspberries and cream cheese. They were both really good. This is a great way to use up any fruits. Arbuclo, let me know how yours turns out. I believe that the linen towel is called for to reduce sticking. In commercial bakeries (and for some of us who are nuts for bread), they use a piece of unbleached cloth to create the couche. These pieces of linen hold the flour in pretty well, and are never washed. After the bread is removed, they're hung up to dry out (they wick moisture away from the dough) and reused. Over time, you need less flour. If you can, devote a towel to this purpose so that you can do the same thing. If you get really crazy about baking, you can buy a cloth from The Baker's Catalog. Thanks for the info everyone. I went ahead and used a cotton towel rubbed with flour. It worked just fine. I have to work on my shaping a little, arbuclo. Photos later. 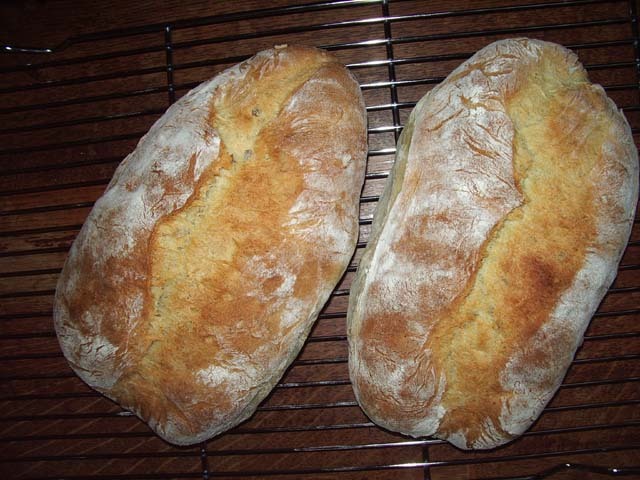 Here's the Rustic Potao Loaves. Like I said, I have a little to work on as far as shaping goes. Oh dear, I finally made eye contact with this thread & the morning has flown by. I've just ordered the Cooking With Julia from Amazon and hope to be joining you soon. But first I have a dumb question. What exactly is an epi? There was a link much earlier in this thread to a King Arthur page which regrettably no longer works. I've searched through the King Arthur web site without luck. Can anyone help? Must go to work now. Will no doubt spend rest of day with tummy rumbling and sugar plums in my head. "Epi" is short for "epis de bles," or "sheaf of wheat." An epi loaf is a baguette that is cut so that it has several pointed sections, roughly resembling a wheat stalk and convenient for passing around the table and breaking into dinner rolls. I posted a picture of some epis of mine way back at post #283 of this thread, but I'll post it again here for your convenience and because I'm proud of how they came out! Here's an updated link to the King Arthur tutorial on epis (offering the wisdom of Jeffrey Hamelman). I still make epis a lot for dinner parties, usually using my standard sourdough dough, made a little stiffer so I can cut it more easily. Thank you Dorie & Seth. And thank you Seth, for reposting your photos. I remembered seeing them but it was beyond me to work my way back through the thread. My goodness! You should be proud. Those are gorgeous. Thank you for the KA tutorial link. It couldn't be clearer. Sigh, yet another thing to add to my "to do" list. Mine turn out basically the same as yours. They taste and look great except I compare mine to the picture. I really like the way they look in the picture. I'm obsessed with this and will keep trying until I can do it! 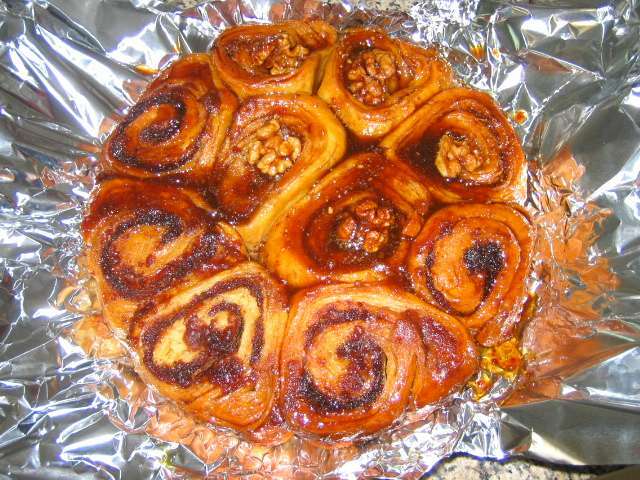 I was thinking of doing the pecan sticky buns within the next week. Anyone want to join me? I don't think mine will be pecan since I seem to be having a difficult time finding some but I'm sure I'll like them anyway! You'll love them. I've made them many times, and I have to say they are my default buns. The only problem is they take so long to make, with the rise and punch down times. It is awesome. Nevertheless I am still willing to look at other recipes, just to see if I can get close to these pecan sticky buns in flavor and texture without having to take all day to make them. Oli -- The reason the Nancy Silverton/BwJ buns are so great is that they're made from brioche feuilletee, or brioche dough that is treated like puff pastry. Of course, you can make sticky buns that won't take as much time and will taste good, but they won't be the same. (I think there's a sticky bun recipe in the King Arthur Baking Book -- I don't have it with me, so I can't check -- that is made with a less rich non-brioche non-laminated dough and which, as I remember, was delicious). With a plain, sweet-dough recipe, you'll gain time, but it's only with time -- and butter -- that you can get the spectacular texture and taste of the BwJ sticky buns. Why not try making them in stages when you've got ahead-of-time time? Make the brioche dough one day and do the butter-turns and filling the next. At this point the logs of dough can be frozen and then baked off when you've got time and a bunch of sticky-bun lovers. 1. Roll them out as thinly as you possibly can. The thinner you roll them out to be, the crispier they will end up being. They start to get chewy if they're too thick. 2. Use enough flour to roll easily, but try not to use too much. When you use too much, the matzohs come out a little white and they can taste a little floury. Don't get too worried about the dough sticking to your pin. I found it pretty easy to correct when the dough started to stick a little. It's a pretty stiff dough to begin with so it won't ever get too sticky. I'm trying to save the last two for my kids to eat tomorrow but I can't stop munching on them. Seth, are they easy to roll out? Do you think they could be rolled through a hand crank pasta machine? I don't own a pasta machine, but I imagine it would work. Perhaps with a machine you might even be able to get it too thin... you need to be able to pick it up and flip it onto a baking sheet in one piece. With the machine you'd also need to cut the dough into smaller pieces than the recipe specifies before rolling, or you'll get matzohs that are a few inches wide and way way too long. The dough is easy to roll out by hand. Each piece takes maybe a minute or two. Seth, you've done a great job describing what needs to be done with the matzo. And I agree with you about the pasta machine. I'd add just one thing -- because the matzo are rolled out by hand and unfurled onto a baking sheet, they are not (at least they're not chez moi) perfectly even and, to me, that's one of the recipe's charms. I love the way the stack of matzo looks when its edges are all higgledy-piggledy. Here are my hot out of the oven sticky buns. I couldn't find pecans so I did half of them with walnuts, sugar and cinnamon and the other half date and cinnamon (date paste is extremely easy to find here...yeah!). They're too hot to taste at the moment but I can see the layers flaking from the lamination technique. I'm certain they'll be ummm, ummm, good! Thanks for the tips on the matzo. I'll see if I can give them a try soon. forget studying for finals, I know what I'm doing this weekend! Sigh.... eyes are filled with tears of longing. They are a thing of beauty indeed. Thanks! I only got a small taste but it was good! I only cooked up half the batch, the rest is still in the freezer. I love that I can keep them there for a few weeks and cook them up in small doses. I did make one mistake, though. I was only cooking up half the recipe but put in the full amount of brown sugar in the caramel. So there was a bit of crunchy sugar on the topping after cooking. Still...no one complained!